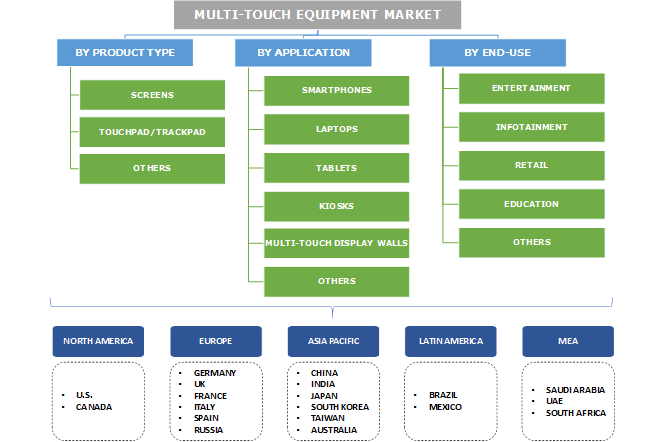 Multi-Touch Equipment Market size was over USD 10.5 billion in 2017, growing at a CAGR of over 10% from 2018 to 2024. The global shipments are expected to surpass 250 million units by 2024. 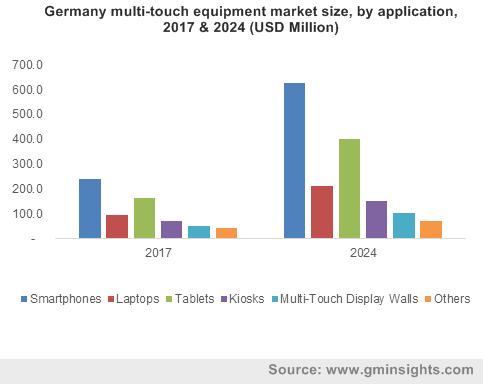 Multi-touch equipment market is expected to grow rapidly due to the increasing demand for devices equipped with multi-touch devices such as smartphones and tablets. The technology enables the user to interact with a system by performing multiple finger gesture. Several operating systems are providing integrated interface support in order to address the growing demand for the devices. For example, mobile OS including Android, iOS and Symbian^3, and desktop OS such as Windows 7, Mac OS X and Ubuntu, support multitouch detection. Individuals, such as panel operators, end users, engineers, purchasers, managers, decision makers, and executives, interact with the technology frequently. These advanced components cater to several requirements in verticals including entertainment, retail, industrial, automobile, and consumer sectors. The development of automotive electronics in the capacitive multi-touch screen is expected to fuel the industry growth over the next six years. Technological advancements, such as tactile user feedback and acoustic feedback, to enhance the performance of the product are propelling the market growth. The manufacturers are using technology such as solenoid, piezoelectric actuation, ciliated surfaces, and pin matrices. The usage of these technologies is allowing the manufacturers to develop new advanced products to expand product offerings, thus positively impacting the industry growth. For instance, industrial 15” LED projected capacitive multi-touch equipment consists of panel and VESA mounting that can operate at (-200 to 600C) temperature with elegant design and five-wire resistive technology. One of the major factors restraining the multi-touch equipment market growth is the high cost of production. The players in the mobile computing market are focusing on reducing the overall production costs due to the changing preferences of consumers. Furthermore, the high costs of glass touch panels and lack of availability of indium tin oxide (ITO) will also restrain the industry growth. Multi-touch screens accounted for over 80% of the global revenue in 2017. The industry is expected to grow significantly over the next six years due to increasing adoption of these screens in several applications such as restaurants, retail, and e-commerce industries. Growing number of devices integrated with the technology such as smartphones, laptops, and tablets will add to the industry growth. These products provide an alternative to traditional keyboards and mouse, allowing the customers to operate complex graphical functions using their fingers. Multi-touch touchpad/trackpad shipments are expected to grow at a CAGR of over 9%. The demand for trackpads is increasing due to benefits such as enhanced experience, improved pointer ballistics, and user-customizable options, thus propelling the multi-touch equipment market growth. Increasing popularity of these systems is encouraging the technology companies such as Microsoft and Apple to develop software to enhance the functionality of basic trackpads. For instance, Trackpad++ installer allows the systems with Microsoft Windows 7, Windows 8 & 8.1, and Windows 10 to upgrade to alternate trackpads. Multi-touch equipment market is gaining traction due to the increasing adoption of tablets such as iPads, with shipments expected to exceed 70 million units by 2024. The development of Android-based tablets has encouraged several PC OEMs to venture into tablet market, due to the gaining popularity of these devices. The increasing ease of use of these systems as compared to the pen-based or stylus-based devices is positively impacting the industry growth. The use of these devices in several application areas such as hospitality, retail, logistics & supply chain, and education will propel the demand for market over the forecast timespan. The market revenue in kiosk applications is expected to grow due to increasing focus of retailers on increasing interactivity is propelling the demand for multi-touch kiosks, thus propelling the multi-touch equipment market growth. Customers are being increasingly benefited by the these displays in kiosks due to simplification of transactions and interaction of customers with the machines. The demand for multi-touch equipment market in retail is expected to grow at 10.5% CAGR. The retailers are investing in such technologies to attract customers, enhance ease-of-use, and reduce the dependence on humans. In early 2017, Walmart started using touch screen platforms in some of their stores to allow product searches. Several retailers are also deploying iPads to enable the customers to order online in-store and perform product searches in the inventories. Growing adoption of these devices in kiosks is gaining popularity to retail sector, propelling the demand for these components. infotainment applications in market are increasingly adopted in the display tables in museums, public transit systems, and in-vehicle infotainment systems. For instance, in July 2017, Eyefactive introduced multi-touch table for a museum in Thailand. The table is equipped with tracking and object recognition technology that allows comfortable navigation by hand gestures. The China multi-touch equipment market was estimated at around 13 million units, due to several players increasing the R&D investments in the manufacture of these products. The presence of several devices & display manufacturers in the region is one of the key factors for industry growth. The manufacturers are developing these products with benefits such as accurate touch points, advanced design, and customers-friendliness for applications such as trade shows and museums & showrooms. The growth of the retail sector in the country is encouraging the retailers to adopt the technologically-advanced products such as interactive kiosks to gain a competitive advantage. Key players in the market include Touch Innovations, COPA-DATA GmbH, IntuiLab SA, MultiTraction, Samsung Electronics Co., Ltd., Perceptive Pixel, Microsoft Corporation, Apple, Inc., FlatFrog Laboratories, and JTouch Corporation. The companies are investing rapidly in the development of new products to gain competitive advantage. For instance, in January 2018, Touch Innovations introduced an all-glass multi-touch display platform. The display supports ten multiple touch-points. The software developers in the industry are developing applications that are supported by these devices such as tablets. The developers in the market are increasingly focusing on newer solutions to incorporate technologically-sophisticated features. The manufacturers are constantly innovating to develop products with wide applicability such as integration with gesture recognition, thus propelling the multi-touch equipment market growth. For instance, the blind and visually impaired individuals may face barriers while operating these screens. Apple iPhone 3GS is resolving such issues by providing screen readers that are integrated with synthesized speech feedback in the advanced products. However, these screen readers are not sufficient as the complexity of the system increases. Growing usage of these devices in industrial applications to ease machine operation is prompting the manufacturers to increase the products for industrial applications. Some of the early multi-touch devices include iGesture Pad and Touchstream Keyboards. With the proliferation of iPhones that used the technology in smartphones, the adoption of technology gained pace. In 2007, Microsoft commercialized Microsoft PixelSense, a table-top touch platform, followed by DiamondTouch by Mitsubishi Electric Research Laboratories. In May 2015, Apple, Inc. was awarded a patent for fusion keyboard that converts the physical keys on the keyboard to multi-touch buttons. These innovations have accelerated the penetration of multi-touch equipment industry over the forecast timespan. These components provide benefits such as fast & accurate response, design flexibility, long product life cycles, easy integration with other devices, durability, and advanced functionality. In addition, the customization of devices allows the users to achieve design goals for systems that perform advanced functions. Increasing consumer demand for advanced smart devices will expand the application and design scenario, thereby contributing to the growth of the market.